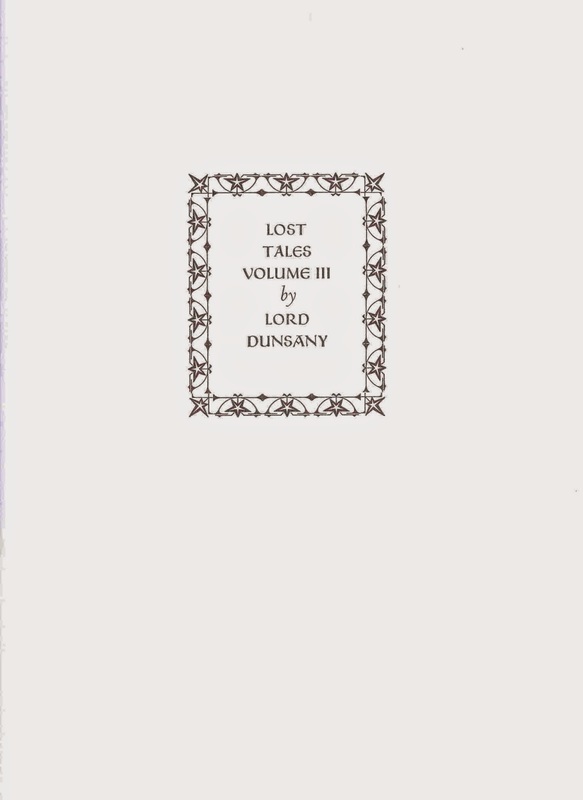 Three letter press booklets of Lost Tales by Lord Dunsany have appeared from Pegana Press, and I’d like to give some account of them here. 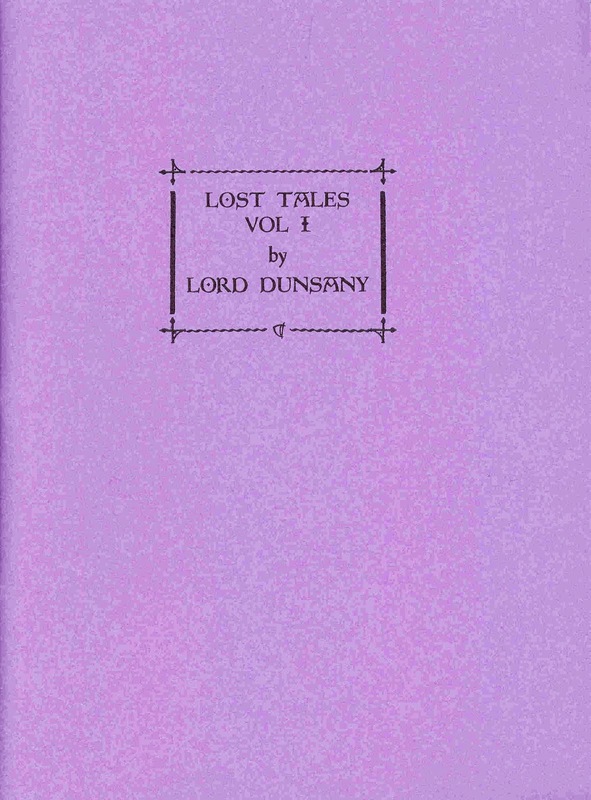 They aren’t quite uniform, and the stories range from the beginning to the end of Dunsany’s writing career. Bibliographical details are incomplete. A few tales are lost gems; most are capable and interesting stories. Most are previously unreprinted; a few are previously unpublished. All three booklets are fine examples of letter press craft. There are hardcover and paperbound versions; I have the paperbound ones (see illustrations). Lost Tales Vol. I (2012). Limited to 128 numbered copies. 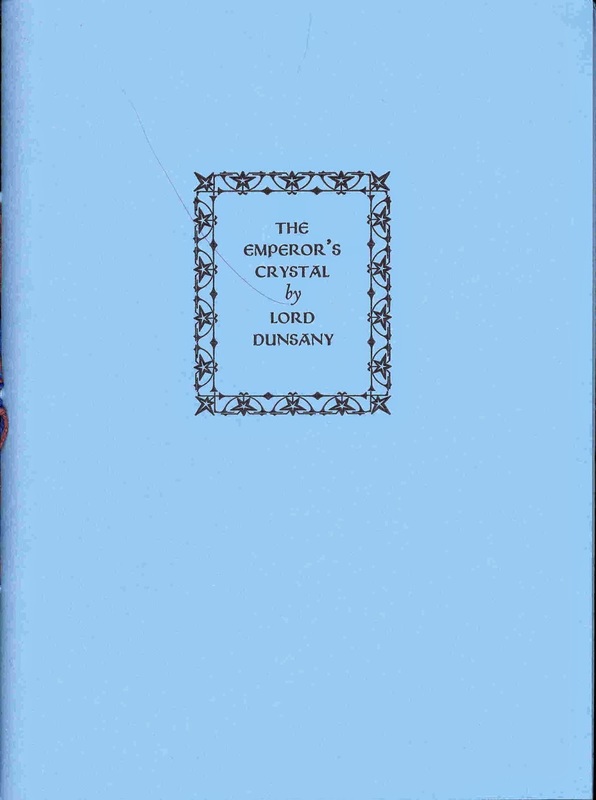 The Emperor’s Crystal and Other Lost Tales Vol. II (2013). Limited to 92 numbered copies. Lost Tales Volume III (2014). Limited to 80 copies. For further details see the publisher’s website, and look around at their other offerings. Mr. Algernon Blackwood selects the Centaur, as having expressed most of himself. “Whatever merit the book may have is perhaps due to the fact that it is a reflection of the impressions of my native county, Gwent, or Monmouthshire, which I gathered when I was a boy. “I am a great believer in the doctrine that a man of letters knows everything vital that he is to know by the time he is 18. Other authors responding include Joseph Conrad (his letter appears in Visiak’s book on Conrad), John Galsworthy, Jerome K. Jerome, John Masefield, George Bernard Shaw, May Sinclair, etc. Peterley Harvest (Hutchinson, 1960) is a remarkable literary experiment. Its sub-title is ‘The private diary of David Peterley’ and it was presented as a journal edited from the Peterley Papers by Richard Pennington. In fact, it is now understood that there are no such papers and that the book is in effect an autobiographical novel. A friend of the editor, Dr I A Shapiro, said in 1985 that it “is largely, perhaps wholly, disguised autobiography.” Pennington has placed many elements of his own life in a fictional framework as if they happened to a character similar to himself, but with certain key differences. For example, while he earned a living as a librarian, his character Peterley has private means, and an ancestral hall (albeit in decay) and leads a leisured, if hectic, existence. We follow him through a series of amatory, aesthetic and artistic wanderings in London, in the English shires and in Prague, each evoked with candour and a certain louche style, in a chronicle of bohemian life whose narrator has some of the panache of Michael Arlen’s dashing modern cavaliers, and some of the mystery of Machen’s many scholarly adventurers, men-about-town with a mission to explore the curious. The lethal effect of drinking Machen’s famous punch becomes clear when the narrator wakes up in unexpected company in London the next day, with little idea how he got there. “Machen’s party,” he wrote “seemed a shadowy fantastic rite performed in the light of torches to the clash of cymbals and the shouts of Bacchantes, a long way off in time and space.” Machen’s daughter Janet Pollock, in recommending the book warmly to me, confided that, in this episode at least, Richard Pennington himself was indeed the protagonist and the Peterley passage is pure autobiography. Peterley Harvest was withdrawn soon after publication in 1960 for reasons which remain obscure. It had been received with bafflement by the critics who did not understand its adventurous form and feared being spoofed. However, word-of-mouth praise for its fine writing and flamboyant scenes and characters ensured that it soon became keenly sought. In his preface, Holroyd more-or-less gave the game away about the book, while still leaving a certain mystification. Even this led to continued doubt, with at least one reviewer wondering if Pennington himself existed. 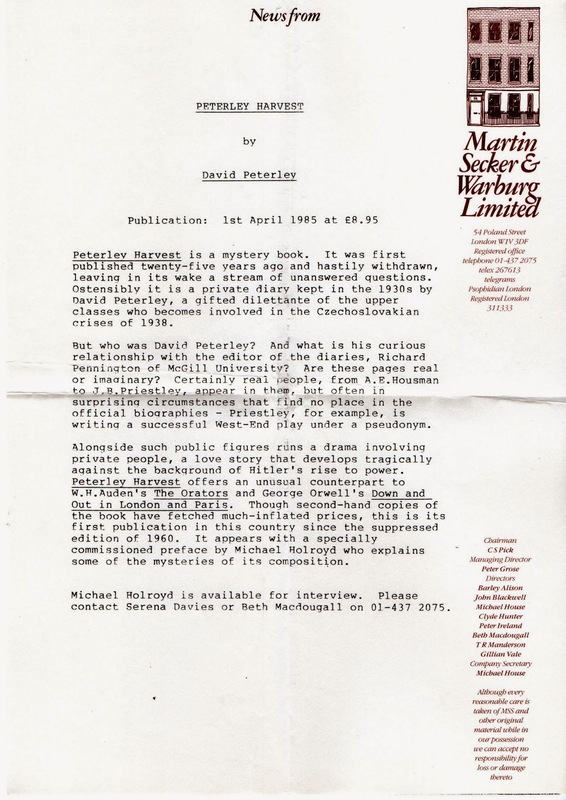 The biographer Claire Harman later described the book as “a fine illustration of the blurability of the line between fiction and non-fiction” (The Evening Standard, 7 January 2002). The author himself never commented upon the nature of the book. Richard Pennington was born in Rugby, Warwickshire, on 6 September 1904. He took a BA at the University of Birmingham in 1924. Dr Shapiro later recalled that “while an undergraduate Pennington already displayed a range and variety of interests, including calligraphy, typography and art.” He was in Australia from 1926-30, where he moved among the circles of the continent’s literary luminaries. In particular he befriended the poet Christopher Brennan, then very neglected, and helped to revive interest in him. On returning to Britain, he trained as a librarian at the University of London, and took up a post in this profession at the National Liberal Club. During the war he returned to Australia and held a post as librarian at the University of Queensland. From 1946, for eighteen years, his career took him to McGill University, Montreal, Canada. Here he is described as “A man of dazzling complexity and great charisma who could be charming or disdainful with equal ease. Highly cultivated and urbane he had definite opinions on people and things which he articulated with irony and a sardonic wit” (“Scholar Librarians: Gould, Lomer and Pennington” by Peter F. McNally, Fontanus, from the collections of McGill University, Vol 1, 1988). While at the university he ran a private press, the Redpath Press, and published opuscules and monographs. These included Biscay Ballads (1958), a book of poems “from the Peterley Papers” which in fact preceded the Peterley “memoirs”. He retired to Normandy, France where in 1974 he acquired a hand printing press and set up his own imprint, the Presse de l’Abricotier abattu. He and the press later moved to Blanzac, Charente. He also worked on a memoir of Christopher Brennan, published in Australia in 1970, and a monumental iconography of the engravings of Wenceslaus Holler, the Prague-born etcher who lived mostly in Stuart England. This study was issued in 1982. A Penguin paperback of Peterley Harvest in 1987 still did not bring a wide readership, and it may always remain a book for connoisseurs of the rare and recondite in literature. Richard Pennington died on 1 May 2003 in Montreal. His papers are held at the Thomas Fisher Rare Book Library, University of Toronto. 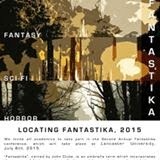 The Fantastika conference takes place at Lancaster University on 7-8 July 2015. There will be some thirty seven brief papers on a wide range of aspects of the fantastic in literature, film, music, folklore and new media, linked by a common theme of landscape and place. Amongst the speakers are Audrey Taylor on Pastoral and Fantasy; Tim Jarvis on "Weird Fiction's Representation Praxes"; Stephen Curtis on “Moon Kampf: The Rise of the Lunar Nazi in Speculative Fiction”; Francesca Arnavas on “The Fantastic Worlds of the Alice Books and the Imaginary Mind”; Christina Scholz, on “‘Lost in the Back Yard Again’: Uncertain Landscapes in M. John Harrison". There will also be Keith Scott on “From R’lyeh to Whitehall: Charles Stross and the Bureaucratic Fantastic”; Douglas Leatherland on “The Nomos of Fantasy: Natural and Artificial Boundaries in Tolkien’s Middle-earth and Le Guin’s Earthsea” and Kaja Franck on “Hunting the Last Werewolf: Ecology, Fantastika, and the Wilderness of the Imagination”. My own paper is on “Supernatural Landscape in British Ambient and Drone Music”. The conference is free: simply email fantastikaconference@gmail.com to register. 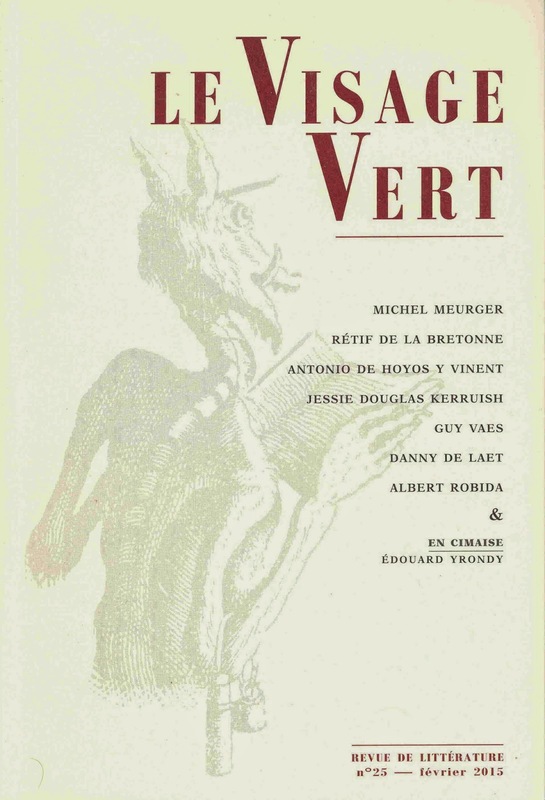 Congratulations to Xavier Legrad-Ferronnière and everyone else editing and writing for Le Visage Vert, which has just published its milestone twenty-fifth issue. 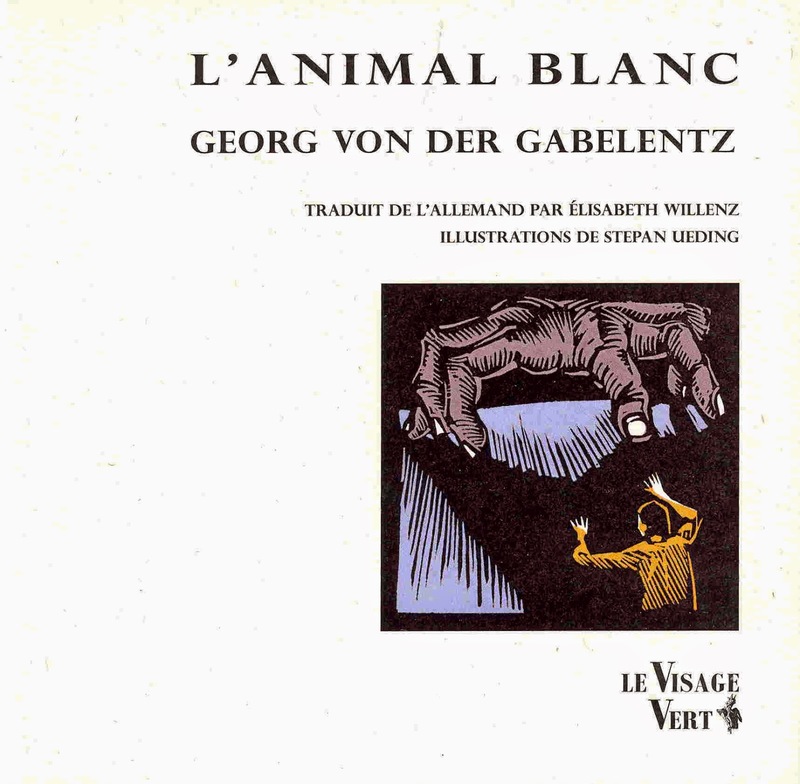 Highlights include Michel Meurger continuing his historical exploration of werewolves; Norbert Gaulard introducing two fantastic tales by Antonio de Hoyos y Vinent (1885-1940), who is described as a sort of Iberian alter ego to Jean Lorrain. There follows a translation into French of Jessie Douglas Kerruish's "The Swaying Vision" (1915), and a previously unpublished text "La Porte" by the Belgian writer Guy Vaes (1927-2012), with a study of Vaes by Danny De Laet. Finally there are a couple of medieval legends written and illustrated by Albert Robidas (1848-1926). Subscribers receive a set of four cards (printed on each side) showing illustrations by for advertisements for a collection of stories by Antonio de Hoyos v Vinent. 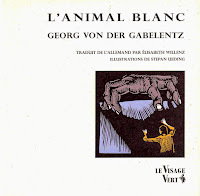 Another recent publication by the folks at Le Visage Vert is a chapbook L'Animal Blanc (The White Animal) by Georg von der Gabalentz (1868-1940), translated from the German by Élisabeth Willenz, with illustrations by Stepan Ueding. "Das weisse Tier" is from Gabelentz's first collection of stories, published in 1904. Yes, Mark Valentine and I were very distressed today to learn that Goodreads has usurped this blog and posted it at their own site, renaming it "Mark Valentine's Blog" even though this blog is multi-authored. Neither Mark nor I gave any such permission for this action, nor did we know it had happened until today. In my view, this moves Goodreads (owned by Amazon.com) into the top of the Corporate Scum Pile. We have sent requests for it to be completely removed, but this is something we should never have had to do, if the corporate raiders would leave other people's stuff alone. The sad thing, too, is that both Mark and I now feel less inclined to post anything other than snippets of news here. All thanks to the unconscionable theft by Goodreads.